Taylored Expressions Release Day! You will be Missed! It is release day at Taylored Expressions! All new products that were sneak peeked for past three days are now available for purchase at the Taylored Expressions store. 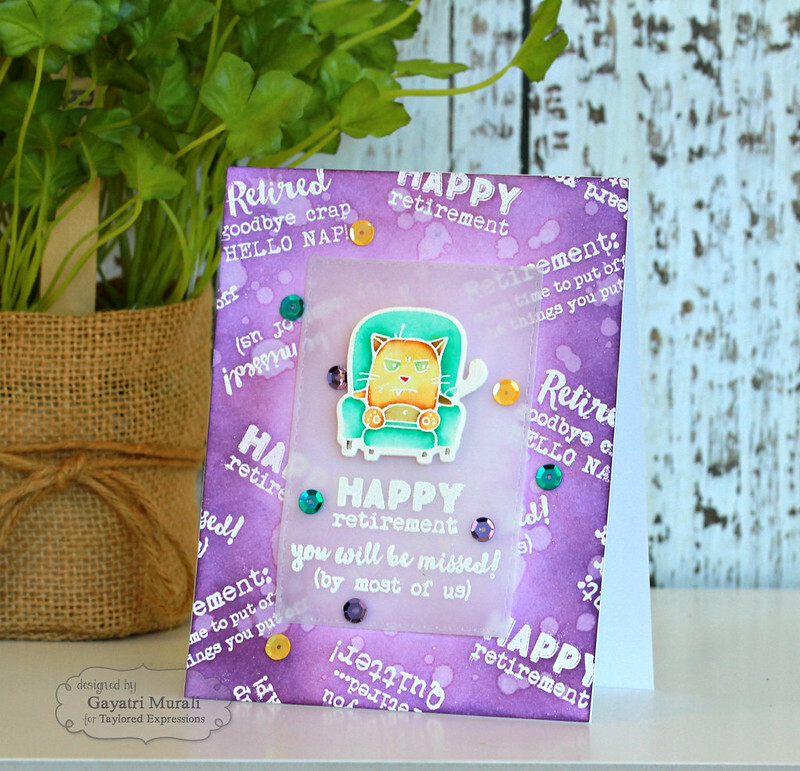 Today I am sharing a card I made using a new stamp set called Clocked Out Grumpling! This is a stamp and die combo. 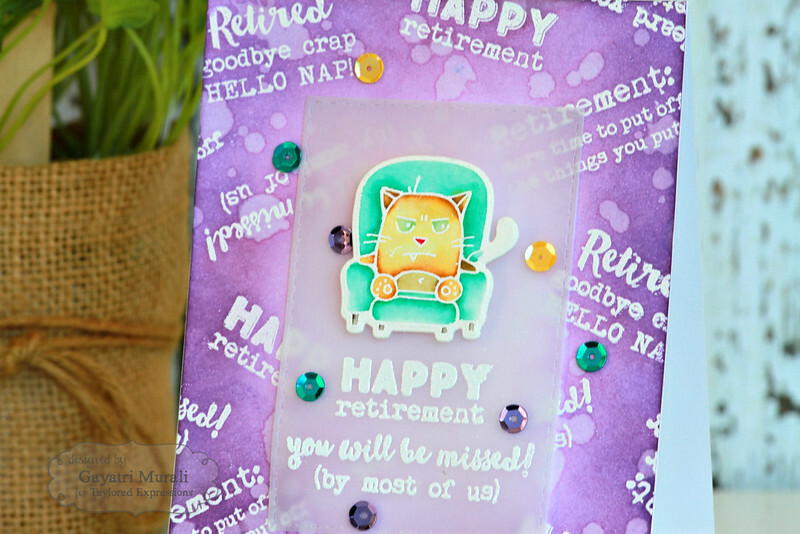 For the background, I white heat embossed all the sentiment from the stamp set covering the entire background. I then sponged Seedless Preserve and Wilted Violet distress inks. Always love emboss resist technique. Everytime the result is magical. I also added some clean water spatter to add texture to the background as well. For the focal point, I die cut a vellum panel using one of the rectangle die from Stitched Rectangle Stacklet. I white heat embossed the sentiment on the bottom of the panel. The image from the stamp and die combo is white heat embossed on watercolour paper and watercoloured using Zig clean brush watercolour pens. I used the coordinating die to die cut the image out and adhered on top of the sentiment on the vellum panel. The vellum panel is adhered to the background using foam adhesive hidden behind the die cut image. Finally embellished with sequins from Rainbow Brights sequins. All the new release stamp set, dies and embossing folders are available for purchase from Taylored Expressions Store. Head over to Taylored Expressions Blog for more inspirations from Taylor and the talented designers. Love how you've used all the stamps on the one card like that with the focal one too. Great. LOL! This card is fabulous! Love it!